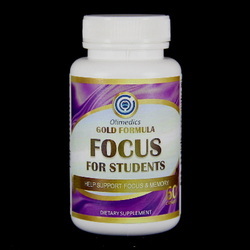 One of our Gold Formula™ products, Focus for Students™ is the collection of the most advanced nutritional science research, designed to bring you the most extensive benefits to growing brain, and to improve academic performance. Focus for Students™ may help support memory, concentration and nutritional replenishment in the young brain. SUGGESTED USE: 2 capsules taken 1 time daily preferably with meals or as directed by a healthcare professional. Active ingredients: Folic Acid, Vitamin B12, Vitamin C, Vitamin E, Docosahexaenoic acid (DHA), Dimethylethanolamine (DMAE), Aicosapentaenoic acid (EPA), Gingko, and Phosphatidylserine.